The great rampart of Haldon, which extends nearly twelve miles from N.W. to S.E., rising to a height of more than 800 ft., divides at its northern end the valleys of Exe and Teign. This is Great Haldon. The southern portion, Little Haldon, separates the Teign estuary from Dawlish Water. Several lines of communication cross this high ground, the principal being on the southern end. One occupies a narrow ridge of land on Great Haldon, having deep valleys or combes falling away on either side, Harcombe, Grammarcombe, Colleywell, Ashcombe and Dunscombe. In length this strategic ridge is rather more than two miles, in width a little more than two furlongs. The ages of history have superimposed their story on its earlier and unknown period. Where the hill begins to slope to the southward an ancient road is seen, enclosed by banks, untraversed, occasionally camped upon by vagrants. A derelict house at “The Thorns” stands actually on it. This old way crosses the modern engineered road at Beggar’s Bush, and keeps a direct line towards the northern end of Ugbrook Park by a steady and continuous descent to the 400 ft line, where it keeps to a ridge of land but a few yards wide between Biddlecombe to the east and the sharp incline towards Town Mills Lane on the west. 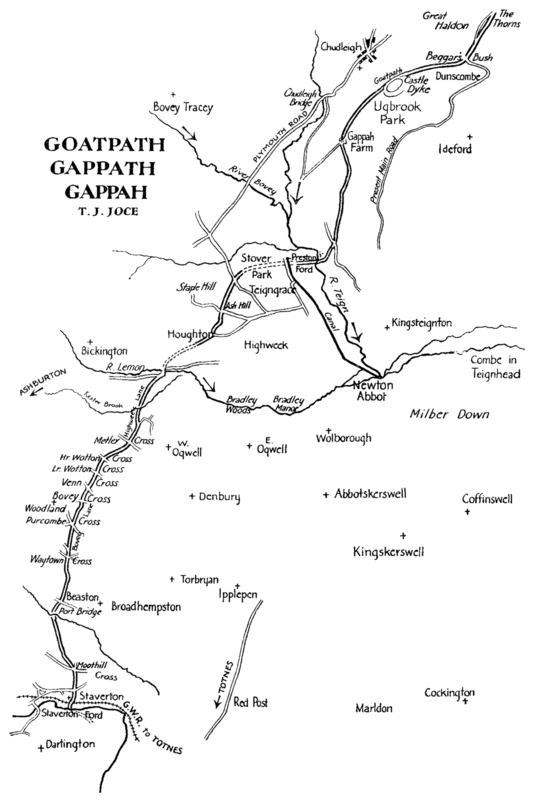 It continues in a south-westerly direction on the narrow ledge between the great bank of Castle Dyke and the precipitous fall of the ground on the Chudleigh side, and thus well deserved its descriptive name ‘Goatpath’. In days when there was but a worn and slippery track and bad weather to boot it must have been a perilous way. The little green hedge nowadays hides the steep declivity and gives a sense of security to the drivers of the few vehicles passing there. The great Castle Dyke is not of the fortress type, ring within ring. A fairly level space of about five or six acres is enclosed within a steeply-faced bank, the fosse outside which provided the material for the earthwork. Some distance S.E. from the great ring is a vallum, evidently to protect access to water supply. The Path and the Camp cannot be considered apart. One is impressed with the fact of this mere ledge-path keeping close along by the high bank of the Dyke, and the conviction is formed that the enclosure is for the safeguarding of animals, whether brought from the neighbourhood or being travelled along the Path. One great change can be observed in this ancient way. The park wall was built, most likely, at the same period as the house. The miry trough of a track was filled with stones, mostly limestone, well rammed in and only in patches have the parish road authorities had to make repairs. The narrow path became a road, but only in its upper portion, for the wall was carried around a detour for estate purposes and that part of the Path which became included in the park was filled up to the grass level and is not now to be distinguished until its course leaves the park again at the south end of Winstow Plantation, the gate of which is the actual point. Thence it leads nearly southward, down a gentle continuous descent, now an ordinary, metalled country lane. The farm Gappah, which is the present form of the old name, lies right athwart it, the course being through the farm orchard, thence directly onward, with occasional indications of its original width, till it crosses the Kingsteignton–Chudleigh road into Preston hamlet where cottages and gardens have been squatted on its margins, thence to the ford of the Teign. Immediately after crossing we are between two ragged fragments of hedges which give the original width. A wooden barrier closes the thicket, which ends in grassland. The entire road, with its river-crossing, is shown so late as 1734, on a map in Exeter City Library. 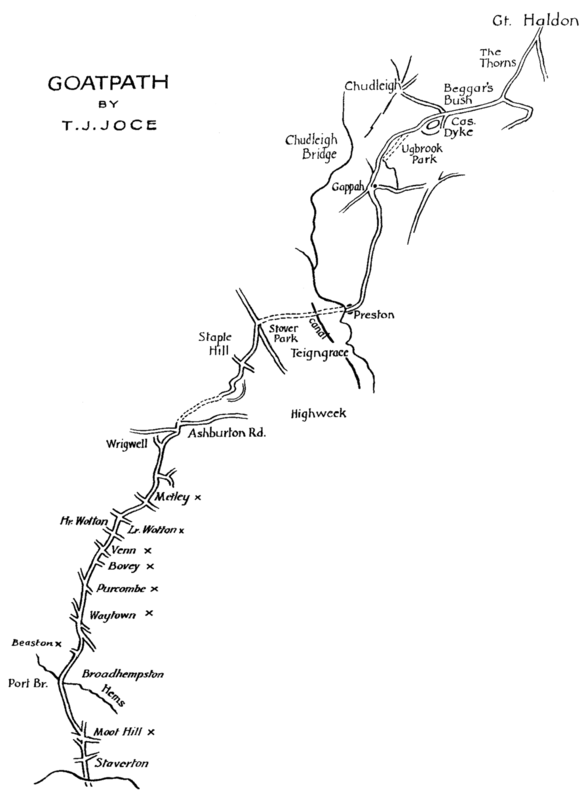 Being now in Teigngrace parish, our way is crossed by the Stover Canal of the eighteenth century and the railway line of the nineteenth. The former cuts through it and the bank of the latter covers it. In Teigngrace Lane, on the western side, two stones are set, having a shallow channel between them leading through the tilled land. The stones are about 12 yds. apart, as though bound stones of an old way. Keeping a straight line from the known point, the river-crossing, between these stones we pass the site of Old Stover House in Stover Park and out at a gate in the park wall on the Bovey road, continuing on an old road, precisely opposite, to Ash Hill, thence to Houghton. The gradients are easy and the curves are those resulting from the undulating ground. All this road is shown on the 1809 Survey. Near Houghton much surface water comes down in winter, and it would appear that the loop road by Perry formed a by-pass, used when the land was sodden. After Houghton, going westward through fields tilled by Seale-Hayne College, the road is a farm track only, but there are gates all the way. By gently falling gradients we reach, and cross, the modern Ashburton Road, through a narrow field named Tongue, the road-strip which joined a larger field. A bound stone still shows the road margin. The bridge over the Lemon at Millcross is of the turnpike period, but there are still traces of the fording-place. Our way rises from the river and curves around to pass by the outbuildings of Wrigwell House, thence over the Kester brook, the farther steep side being taken obliquely and with wisdom. In this region of good land we find a rare thing – a short stretch of our way in its original width, near Metley, and here the lane is known as Highweek Lane from the parish through which we have just passed. Thence we go on to Higher Wotton Cross and Lower Wotton Cross, past those farms. Next we come to Venn Cross near the farm of that name. The next is Bovey Cross, our old road being known as Bovey Lane, indicative of its direction. An older road to Bovey than the present one went by Staple Hill, near Ash Hill. Then comes Purcombe Cross where two garden-strips of squatted land show its former width of roadway. The next is of interest, Waytown Cross, named from a nearby farm-settlement, part of which is on the way itself, leaving only a narrow lane. At a distance of a mile and a quarter is Beaston Cross, a vantage point whence our old road is seen crossing the broad, open valley of the Hems streamlet (whence the parish perhaps derives its name) and breasting the long hill beyond. Over the streamlet is Port Bridge, a name which suggests a market or fair by the wayside, a relic of which may be the lonely Port Bridge Cottage. The brook makes a curious Z-bend, the middle of which was the ford, or one may rather say, the wayfarers traversed the stream-bed for a considerable distance. The curve up from the water shows with exact precision that its course was continued on our old way. The long up-gradient, a channel deeply worn in the rock, at times seven feet deep, telling of ages of use, almost derelict now, is in Staverton parish, and the descent begins towards the Dart. We have another four-cross-way, bearing the Saxon name Moot Hill Cross, clear evidence of its prominence in that age. On the long downhill way to the river our road is crossed by the valley road at an awkward rocky hummock, causing the irregular cross-way at Staverton Village; thence passing, unconformably to the general usage, the east end of the church. No bridge has usurped the place of the ford of the swiftly-flowing river, surely a dangerous passage except at lowest water, and great delays had to take place till freshets had subsided. The current has to be crossed diagonally, and a shingle bank, now bush-grown, on the farther shore, forms Staverton Ford Island, and after the runlet is passed we are on a grass-grown track in the historic Dartington, where we will take leave of the pre-historic Goatpath.